A private contractor and Wyoming Department of Transportation personnel are continuing temporary repairs of new cracks in WYO 296 on the switchback above the Chief Joe Slide area. The contractor, Geological Stabilization Inc., (GSI) of Grand Junction, Colo., completed repairs May 1 on the Chief Joe Slide. Work on the Chief Joe Slide included installation of a soil nail wall, according to WYDOT resident engineer Todd Frost of Cody. During the work on the Chief Joe Slide, Frost said WYDOT employees began monitoring another minor settlement area directly above the slide area on the switchback above the slide. “WYDOT contracted with GSI for stabilization of this small settlement area. Work started May 2. At this time, traffic delays are minor,” Frost said. In other news, WYDOT and U.S. Forest Service personnel met in Cody to continue development of a permanent repair for the Chief Joe Slide. 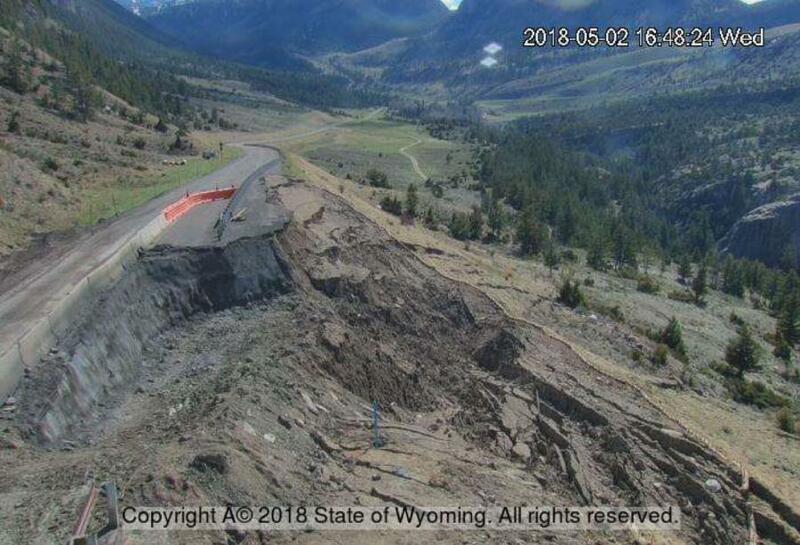 WYDOT began working in the area last fall with geology crews drilling the slide area to help determine its size and the possible scope of repairs. The work last fall and design through the winter will help to accelerate the permanent repairs, Frost said. A public meeting for Sunlight Basin and Crandall residents, and open to all citizens, has been scheduled for 12:30 p.m. May 24, at the Chief Joseph RV Park, formerly the Painter Outpost, near the Clark's Fork River. The Chief Joe Slide began sliding on April 19, and single-lane traffic control over the slide area has been in place since then. The slide area is located in the same location as a similar slope failure last spring. The Chief Joe Slide is located at milepost 26.1, about 20 mi. west of WYO 296's intersection with WYO 120, northwest of Cody. For information about WYDOT's work, contact public relations specialist Cody Beers at 307/431-1803.